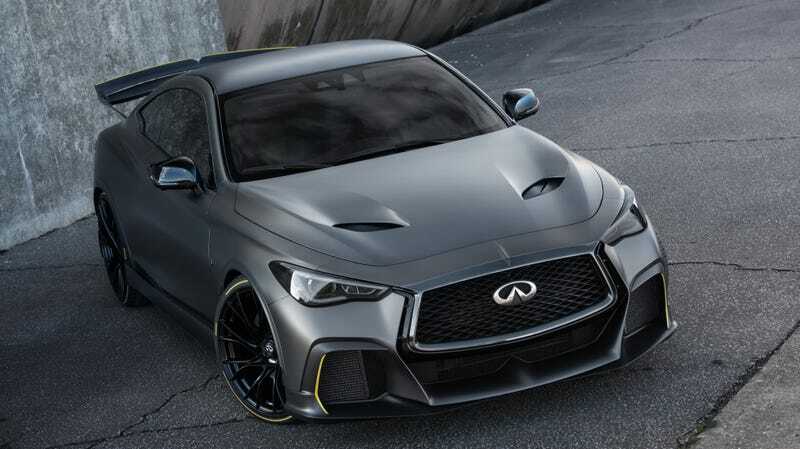 Infiniti Project Black S: F1 Hybrid Power But Will It Happen? Yesterday, Infiniti announced a new prototype called the Project Black S that would use Formula One-style, performance-oriented hybrid tech. It floated some extremely seductive performance figures—563 horsepower, zero to 62 mph sprint in under four seconds—but at this point in the game, I’m fed up with empty promises from Infiniti. Infiniti isn’t shy when it comes to presenting us with mind-blowing cars and prototypes. There was the Q50 Eau Rouge in 2014, which used the twin-turbo V6 from the Nissan GT-R, the retro Prototype 9 Concept, the sleek Q Inspiration Concept and the extremely cool Prototype 10. We’re not even done: there’s also the Q60 Black S Concept from last year, which boasted 500 HP with similar KERS-style hybrid power. It’s very similar to this concept and also never got put into production. Have we seen any these concepts go anywhere? No. And, as a new one was just announced, I really can’t be too thrilled about it because the odds are good that it won’t happen. This lukewarm approach to punching up the brand isn’t a new revelation, either. It begs the question of what Infiniti is actually doing, besides making nice-ish SUVs and sedans and coupes that can’t decide whether they want to be sporty cars, high-tech cars or pure luxury cars, and often miss the mark trying to be all three. Infiniti was a product of Japan’s automotive bubble era, which also spawned Lexus and Acura. But unlike Toyota, it seems like Nissan hasn’t really known what to do with its luxury arm. Carlos Ghosn’s leadership is great at cost-cutting, but that doesn’t lend itself to running a luxury brand properly. The brand’s uncertainty isn’t new, and even the bosses have taken note. Back in 2013, we learned that Nissan nearly canceled Infiniti. That kind of mood really hasn’t lifted, especially when you consider Nissan’s own stagnating line (the 370Z and the GT-R are awesome but they are old, man) and that Infiniti just did some badge engineering with the new QX30 instead of creating a new car. Infiniti’s latter years have yielded a few bright spots, like that very cool and advanced variable compression ration engine, but since the brand has said that it’s pretty much going all-electric or hybrid by 2021, I don’t see how that engine has much of a future there. And while we like the 400 horsepower Q50 and Q60, we can’t really call them class leaders. You need products that can stand tall on their own two feet, something Cadillac is learning the hard way, and Infiniti just doesn’t really have one. It can’t even claim to occupy the bang-for-your-buck niche either, because if you want an affordable but otherwise quite excellent sports sedan, you buy a Genesis G70—which can be optioned with a manual. It feels like Genesis is poised to eat Infiniti’s lunch, despite the latter’s 25-year head start. At its core, I get the sense that Nissan just never put the same effort into Infiniti as Toyota did with Lexus, whether it was through funding or project strategy. Lexus cars got dedicated chassis and bodies. Infinitis got rebadge work, whether from more plebeian Nissans or JDM cars, until pretty recently. Which makes seeing those incredible concepts all the more frustrating. With the knowledge that Infiniti is currently happy making cars that give you less of an opinion than if you were to look through a Gap fall catalog, it’s tough to get honestly excited for them. Know how to drum up some excitement and credibility? Build one of the damn things. I won’t pretend to know what happens in the boardroom meetings, where execs discuss future endeavors of the brand. Electrification is more than likely the next step for Infiniti, which is something you could say of every automaker. Maybe it’ll carve out something cool there. Maybe the electric car that it brings to market will actually look like that Q Inspiration Concept thing. At least it’s said to have a dedicated platform. But if the brand comes out nothing more or new, then what is the point of Infiniti?